Every home, every customer and every requirement is unique, which is why we make sure we have a full range of straight stairlifts to suit. Our carefully selected range of enduring straight stairlifts allow us to offer not only choice in adaptability, whether now or in the future, to suit our customers’ needs and conditions but also to blend as seamlessly as possible with your home’s interior and personal requirements. No matter whether your home is classic or contemporary we are confident that you will find a suitable solution from our range. Our carefully selected range of straight stairlifts are industry-leading enduring products, renowned for reliability, ease of use, and importantly something often overlooked at initial purchase – low-cost future maintenance. 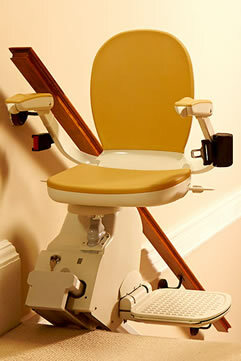 The HomeGlide Extra is a premium stairlift, for those who want the ultimate in options, luxury and elegance. Colour options available to suit your home. Probably the No 1 selling lift in the UK, a no nonsense stairlift, afford yet robust enough to provide years of reliable service.